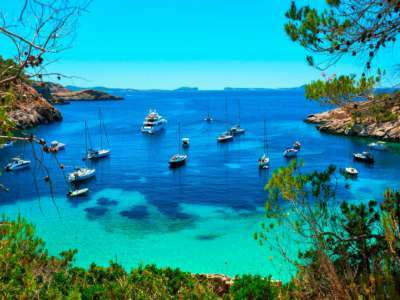 The nearest of the three Balearic Islands to the Spanish mainland, Ibiza remained almost unknown to tourism until the 1960s. Measuring just 14km wide and 42km long, it has 72 beaches, a wealth of cultural and historic diversions, superb restaurants offering both traditional Ibicenco cuising and international fare, and diverse leisure facilities. While it is well-known as a clubber’s paradise, this holds true only in the main urbanisations such as Calle de la Virgin and San Antonio; much of the island retains its old charm, with the northern countryside in particular a patchwork of fruit trees, wooded hills and small rural villages with attractive Ibiza properties for sale. Though it remains popular with package holidaymakers, Ibiza has started to go a bit more upmarket. Many new build developments are tapping into the recent lethargy of the mainland property market and the discovery of Ibiza by tourists who are eager to find a good mixture of old world charm and the convenience of modern living. There is Ibiza property that caters for all budgets, from small studio apartments nearer the cosmopolitan hustle and bustle of the main towns to expensive villas that offer peaceful solitude, with exciting nightlife on such a small island just a short drive away. In recent years, Ibiza property has enjoyed an annual capital appreciation of between 15 and 40%, making it an excellent investment. Major tourism makes renting out your Ibiza property lucrative as more and more Europeans discover its charms. San Antonio, despite its reputation, is actually a nice mix of tourist areas and local shops, bars and restaurants. Prices for apartments in the towns start at around 100,000 EUR, villas from around 250,000 EUR. With many new infrastructures being put in place, the island is becoming ever more attractive to permanent and holiday home buyers looking for Ibiza property. These include a motorway between San Antonio and Eivissa, golf courses and two large marinas. A strengthening demand for short-let apartments for the summer season means prices for suitable, hard-wearing Ibiza properties for sale in popular areas have risen faster than the average.